This is old version SHAREit 3.6.18 apk for Android, you can install it if you want to downgrade or install old app. It is top Tools apps from SHAREit Technologies Co.Ltd. However, how if you want to share photo and audio files from android-based smartphone to PC or notebook? Bluetooth is not an option since some old device does not have such thing. The only option is by using USB cable but it takes times. At the same time, internet connection is not fast as it should be, so one audio may need minutes. You will rely on local network but ordinary user may not familiar with this system. They require app that simple enough to activate it without setting any technical side. This is where SHAREit comes with excellent functions. Besides sending file through network, this app can use group member to share files for more just one person. This feature saves time because you do not have to do the same thing repeatedly just for sending files. Another function is for backup contact or any messages from old device then transfer them to new one. With this app, you do not have to bring USB cable or many devices. For student or worker, this app will help to adjust presentation file from PC to smartphone. 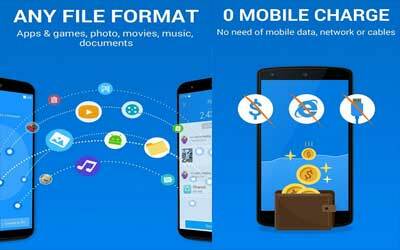 Therefore, SHAREit for Android is the best sharing app that offers more what you expect. Now you can transfer multiple files at the same time!